36. Ziziphora L., Sp. Pl. 21. 1753. L., Gen. Pl. ed. 5: 13. 1754; Benth. in DC., Prodr. 12: 364. 1848; Boiss., Fl. Or. 4: 585. 1879; Briquet in Engler & Prantl, Nat. Pflanzenfam. ed. 1, 4, 3A: 292. 1896; Mukerjee in Rec. Bot. Surv. Ind. 14, 1: 116. 1940; Rech. f. in Phyton (Austria) 3: 161-172. 1951; Juzepczuk in Komarov, Fl. URSS 21: 381. 1954; Hedge in Notes Roy. Bot. Gard. Edinb. 23: 209-221. 1961; Rech. f, Fl. Iran. 150: 480. 1982. Perennial or annual herbs, strongly aromatic of peppermint. Leaves simple, entire, ovate to oblong, nerves ± prominent beneath. Verticillasters many-flowered, forming capitate or elongated spike-like inflorescences. Flowers often male-sterile. Calyx narrow tubular, villous in throat, slightly bilabiate, teeth short, ± connivent in fruit. Corolla white, rose or purple; tube little exserted beyond teeth; upper lip straight, subentire; lower lip 3-lobed. Stamens 2, included under upper lip or subexserted; anther margins often cohering, thecae unilocular by fusion or 2-locular with a fertile theca and a separated reduced lower theca, fertile or not Staminodes present. Style 2-lobed of markedly dissimilar lengths. Nutlets ovoid, smooth, brown, not trigonous. A mainly SW Asiatic genus extending to E Europe and, eastwards, to the Himalayas and the Altai mountains. The annual species are fairly distinct, taxonomically; in contrast, the perennials are the reverse and in need of a major overall re-assessment. Ziziphora clinopodioides subsp. afghanica (Rech. f.) Rech. f.
Ziziphora clinopodioides subsp. pseudodasyantha (Rech. f) Rech. f.
Faldermannia tenuior (L.) Ter.-Chatschat. = Ziziphora tenuior L.
Faldernannia parviflora Trautv. = Ziziphora tenuior L.
Ziziphora acutifolia Month. & Auch. ex Benth. = Ziziphora tenuior L.
Ziziphora afghanica Rech. f. = Ziziphora clinopodioides subsp. afghanica (Rech. f.) Rech. f.
Ziziphora pamiroalaica Juz. 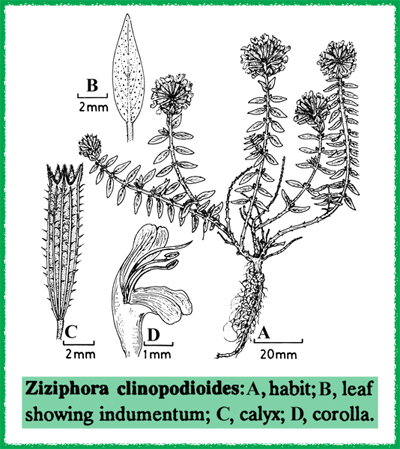 = Ziziphora clinopodioides subsp. pseudodasyantha (Rech. f) Rech. f.
Ziziphora pseudodasyantha Rech. f. = Ziziphora clinopodioides subsp. pseudodasyantha (Rech. f) Rech. f.